I was reminiscing recently with my friend Brooke, a hakujin who lived in Japan for a couple of years, about the great bento box lunches that you can buy and enjoy on the high-speed Shinkansen trains in Japan. That got me craving that efficiently packed, comfort food in a box, which is more typically made by moms for their elementary-school kids to take to school. So I decided to try a takeout bento place I'd spotted in Costa Mesa, a couple of doors down from Ango-tei, near Mitsuwa Marketplace (natch!). The clever name, Bentoss, caught my eye, but I was skeptical about how good the food would be. Positive J signs as I walked into the small, bright shop: samples of the many bento options in an enclosed glass case; notices and posters in Japanese; a perky female clerk who spoke English with a marked Japanese accent (trouble with the Rs). Another very J touch: advisory notes (written in English) posted throughout the bento display case, recommending that the food be consumed within 2 hours of purchase. 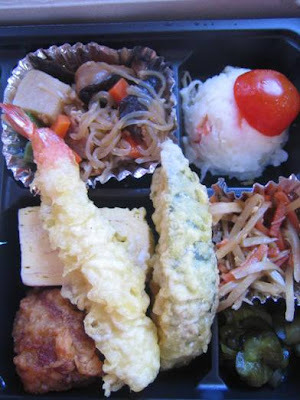 There are a couple dozen types of bento boxes to choose from, ranging in style from the traditional makunouchi of broiled fish, rice, pickled and stewed vegetables, to more "Western-style" bentos with a hamburger patty served on fried rice, or pork katsu with curry. Prices range from $5 for a simple chicken bento (more like a better version of a food-court chicken bowl), to $15 for the Bentoss Special Makunouchi, offering rice, beef, pork, fried shrimp, broiled salmon, egg omelette and stewed veggies. 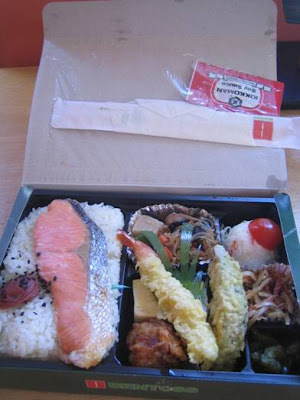 I ordered a classic Japanese bento: the Wafu Makunouchi, $8.95 - a pared-down version of the Bentoss Special. "A handmade and fresh meal. Healthy and Safety. 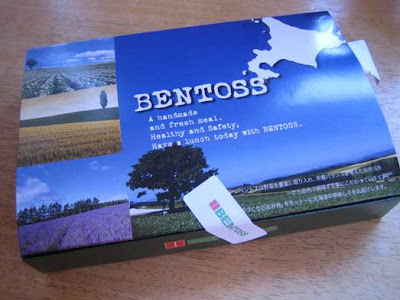 Have a lunch today with Bentoss." Starting at the left side of the box: The requisite rice was topped with a big, puckery-sour (yay!) 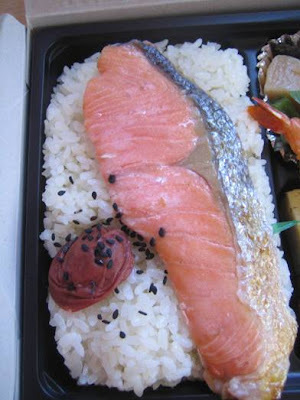 umeboshi pickled plum and a nicely broiled piece of salmon, seasoned simply, as it should be, with a bit of salt. I definitely enjoyed this part of the bento the most. In the center of the box, clockwise from upper left: niku-jaga (potato, carrots, shiitake mushrooms and potato noodles stewed with small pieces of beef); potato salad with cherry tomato; kinpira gobo (slivers of root vegetables cooked with soy sauce and sprinkled with sesame seeds); pickled cucumber; a piece of tempura shrimp and a piece of tempura kabocha pumpkin; one kara-age chicken nugget (the J version of fried chicken, with the bird marinated in soy sauce before frying); one piece of tamago (slightly sweet omelette). I gobbled the tempura pieces down. Even without a dipping sauce, they were both tasty, and yes, best eaten immediately so they don't get soggy. The kara-age chicken is also a traditional favorite for everyone; how can you not enjoy flavorful fried chicken? The egg was fluffy and slightly, not strongly, sweet - perfect. A good niku-jaga is such a Japanese home-cooking classic; this one was pretty good, though the flavors were on the thin side. I love Japanese potato salad so much more than the runny, bad-tasting American deli salads; the J version is lighter, drier in consistency and refreshing, studded with cucumber slices. I'm also typically a pickled cucumber fanatic, but the Bentoss version was just OK - crunchy and tart enough, but there was a slight chemical aftertaste. 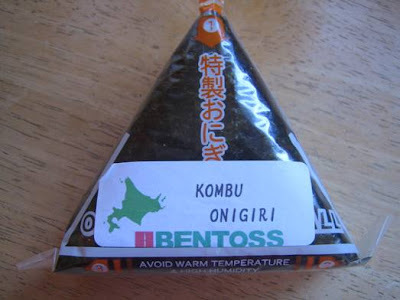 A chemical aftertaste was just one reason I was completely disappointed with the kinpira gobo, usually my favorite homestyle dish. The dish clearly hadn't been cooked long enough with the right ingredients; it was strangely bland, finishing with the weird aftertaste. 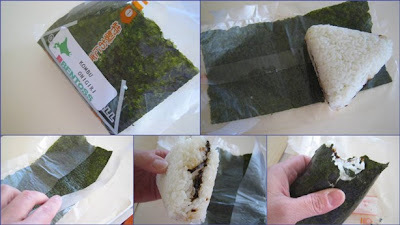 It's wrapped in that ingenious onigiri packaging that you see at all the fast-food places in Japan that sell onigiri (food stands and the ubiquitous "konbini" convenience stores): the outer seaweed is covered in plastic and then wrapped around the rice ball, to keep the nori separate from the rice and prevent a sticky mass while in transit. Mmmmmmm ... such a satisfying comfort snack, one that always takes me back to my early days of elementary school, when I wasn't self-conscious yet about being the only kid at lunch with a strange rice ball to eat, amid a sea of peanut butter-jelly and bologna sandwiches. I'm loving the posts. They are getting more and more engrossing for me. I love the step by step tips to making some of the dishes. I look forward to our sushi date tonight! Funny that you said the kinpira gobo was not good. 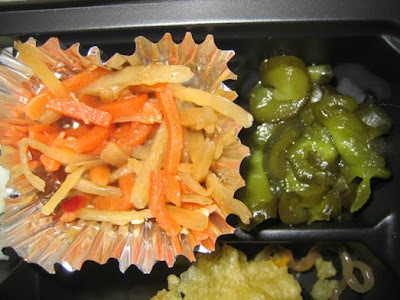 I looked at the pictures of the bento box before reading the post and thought to myself, "the kinpira gobo looks fucked". I bet it came out of a plastic, vacuum-packed, bag.